Melodie Beylik received her BFA from the California College of Arts and Crafts where she learned how to blow and form hot glass. She continued her studies in art at Mills College where she received her MFA. Melodie went on to the Bildwerk Factory School in Germany, then to year scholarship study in Sweden. 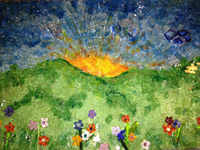 Melodie has continued to travel and study with many masters of glass. She uses her designs and knowledge to create her current work. I was born in Minneapolis, Minnesota and raised in North Dakota. As a boy in the mid-west during the 1970's, I had limited exposure to the arts. Sitting down at the potter's wheel for the first time in a high school ceramics class, I immediately felt comfortable and know I was meant to throw clay. I've been doing just that since moving to California about thirty years ago. Glass has been used to contain what is precious for over 5,000 years. This knowledge, combined with her love of the garden, has become a foundation for Kim’s pieces that celebrate themes of nurture, memory, light, and fecundity. An Honours graduate of Canada’s Sheridan College School of Craft and Design, Kim’s work has been recognized internationally for its narrative content and sense of whimsy. 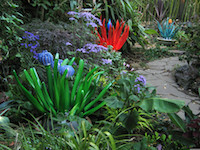 Kim makes her glass in Berkeley, finishes it in Oakland and exhibits most often where glass and gardens meet.